Programming CRICKIT for Selective Soldering: A Deep Dive PART 2 @adafruit #manufacturing #manufacturingmonday « Adafruit Industries – Makers, hackers, artists, designers and engineers! In our first post we discussed the design of the CRICKIT panel. In the second part of this continuing series we’re going to discuss our thought process behind the creation of our solder and flux paths for the board itself. Let’s jump right in! It’s important to remember that whenever one begins programming a board for selective soldering to have a sense of “play” or freedom. Use your imagination! 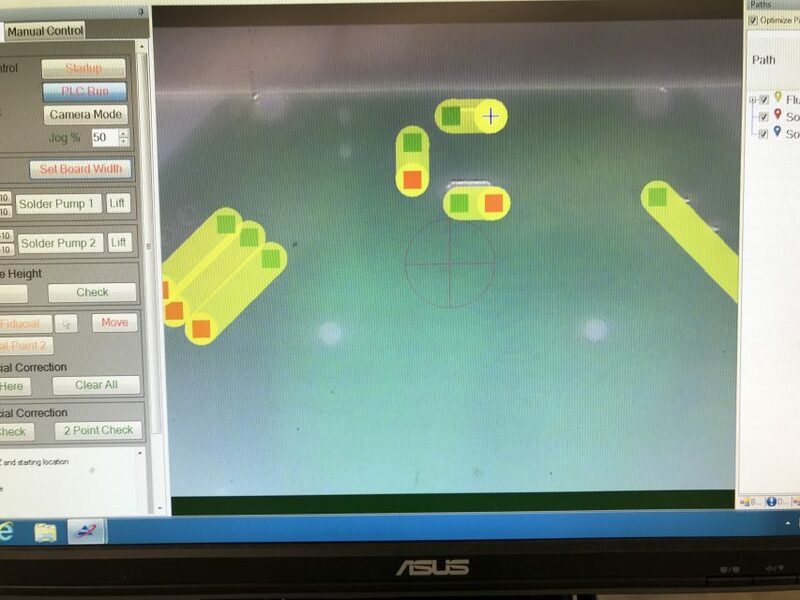 At the outset it’s important to sketch flux and solder paths FREELY within the software. 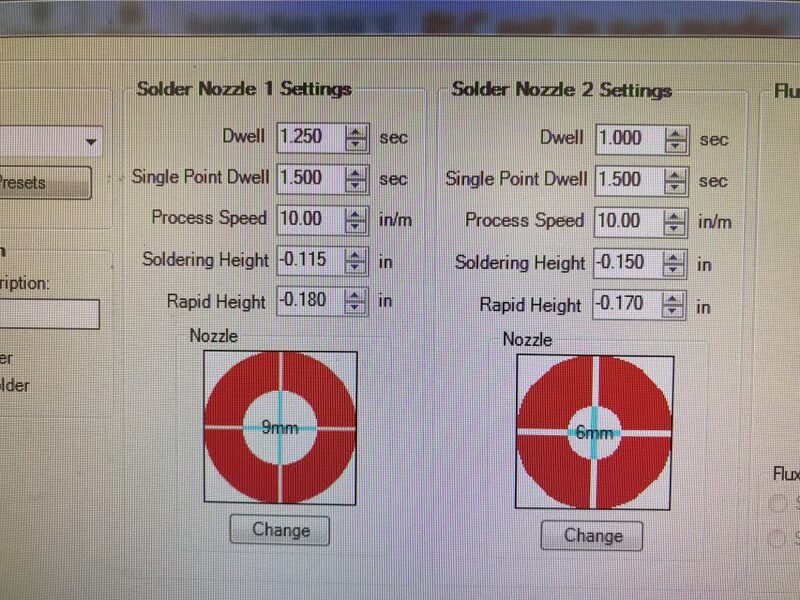 Choose a nozzle size that you believe will provide adequate heat “soak” to the lead and surrounding pad and beginning creating flux and solder paths for the relevant sites. You don’t have to commit to anything yet! Paths can be deleted, tweaked or moved at will-so sketch away! We’re still at an early stage in the programming process! Once you’ve slugged in some rough solder and flux paths it’s time to begin considering the physical topography of the board. Be aware of adjacent boards! When you wick away at a 45 degree angle from a solder joint are you inadvertently filling in plated thru-holes on that board? we need to be aware of the thermal mass of the leads we’ll be soldering on any given board. This was especially true when we were programming the CRICKIT. leads of different mass will have different wetting characteristics and will thus need to be “soaked” with heat for different durations. So how can we control this? The two main ways we can control this are by manipulating the solder “dwell” and “process speed” parameters. When we increase the amount of solder dwell on a given path we’re allowing the nozzle to pause for a greater amount of time before moving. As pad size or component size increases, we typically increase the amount of dwell to allow for more heat transfer. This is especially true in the lead-free selective solder process where more dwell is usually required. Process speed refers to the rate at which the nozzle feeds into the components. Increasing the process speed value will cause the nozzle to move faster along the sketched paths. Striking a balance between these two parameters is part of the fine-tuning that occurs once the program is ready to run. Contemplate these guidelines! They underpin a tremendous amount of the philosophy behind how we will refine and optimize our program. Join us for Part 3 of the deep dive as we explore the actual flux and solder paths for the CRICKIT program itself and how we optimized them for our production run!